"It's All Green in Toronto"
It was All Green in Toronto as the DLSAA Toronto chapter played host to the 6th DLSAA World Congress (WC VI) at the Sheraton Parkway North Hotel and Convention Center, north of Toronto, Ontario Canada from May 24 to 27, 2007. Over 200 delegates representing the different colleges campus, regional chapters and affiliates from the Philippines, Northern and Southern California, Chicago, East Coast (New York and New Jersey area), National (Washington DC area), Vancouver and host Toronto attended. Festivities started Thursday night when the Toronto chapter officially welcomed delegates and guests at the reception held at the hotel’s Presidential suite. DLSAA President Jay Gervasio and Toronto Chapter President Tom Mascardo both gave their welcome remarks. Toronto chapter members Danny Raralio and Leo Flor provided the background music while Rhett Abarquez crooned several Spanish ballads to the delight of the crowd. On Friday morning, the WC VI Golf Tournament teed off at the Caledon Woods Golf Club. Winners were Mandy Reyes (overall champion and Low Net) from the Northern California chapter; Mars Cebrero (Low Gross) from the Toronto chapter; Nick Limson (2nd Low Net) from the Southern California chapter and Bill Lutz (Most Honest Golfer) of the Toronto chapter. The fellowship continued at a reception held that evening. About a hundred delegates from all the chapters attended. Providing the night’s entertainment was “The Toronto La Salle Band” headed by Cris Canlas and Dante Torralba. It was the band’s performance debut. The band played exceptionally well, given the fact it was only formed four months earlier. On Saturday morning, the DLSAA Board of Directors’ first order of business was the election of its new President and Vice-President for Finance and Treasurer. After only one deliberation, Juan “Johnny” A. S. Valdes was elected as the new DLSAA President, while Johnny C. Sy was elected as the new DLSAA Vice-President for Finance and Treasurer. Their two year terms took effect on June 1, 2007. The day’s plenary sessions began with WC VI Co-Chair, Sid Borromeo, delivering his welcome remarks and DLSAA Board adviser, Br. Bernie Oca, FSC gave the invocation. Outgoing President Jay Gervasio then presented a report on his objectives and accomplishments in the past two years of his term. Soon after, the chapter presidents or their representatives took turns presenting their own plans on how to make the chapter more relevant and helpful to its members. Ending the morning’s session was DLSAA Chairman, Lito Tanjuatco, who gave an overview of the De La Salle Philippines (DLSP) and the federalization of the DLSAA. In the afternoon session, Br. Armin Luistro, FSC, DLSP President with Br. Bernie expounded on what DLSP is all about and the current projects underway. It aims to implement effective services and provide savings to the 18 schools through a more centralized network. 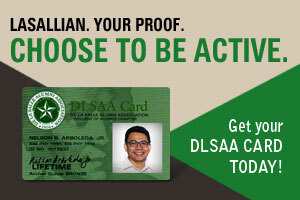 The DLSAA’s own structure will soon adapt to reflect the changes. The presentations continued with an environmental talk given by Lawson Oates from the City of Toronto. He presented an overview of the different conservation, recycling and energy efficiency projects that the city is involved in. Soon after, Ben Eusebio, Lasallian Institute for the Environment (L.I.F.E.) Director, followed with his own presentation of the institute’s projects. The Southern California chapter, headed by President Denny Cagampan, showed a video and a formally extended to the delegates, an invitation to attend the WC VII at Los Angeles during the 2009 Memorial Day weekend. The plenary sessions ended with Jay Gervasio awarding plaques to various chapters for their outstanding performances and achievements. Awarded were the DLSAA Toronto Chapter (2007 Outstanding Chapter Award) and Tom Mascardo (2007 Outstanding Chapter President Award). Special Citations were awarded to the DLSAA Grade School and High School Manila Chapter, DLSAA College of St. Benilde Chapter and the DLSAA Southern California Chapter. Highlighting the congress was a Gala Ball. It was attended by over 200 delegates, friends and guests. Co-emcees of the evening were Danny Raralio and Sonny Ungco from the East Coast chapter. Sonny performed his famous green archer routine and delighted the crowd with his singing/comedic acts. Robertino Lim, son of Roy Lim from the East Coast chapter, entertained the crowd with his singing. Music was superbly provided by “The Full House Band” headed by Mon Torralba of the Toronto chapter. He is also a member of the famous “Hotdog Band” in Manila. The music and the atmosphere were equally “electrifying” that the event finished well into the night. On Sunday, a mass was celebrated at the hotel. Soon after, a relaxing brunch and boat cruise at the Toronto Harbor followed. This was attended by sixty delegates and guests. During the cruise, Br. Bernie, Miss Josefina Alburo, Sonny Ungco, Jay and Malou Gervasio “volunteered” as dance partners with the guests.